1. On January 29,1955, under the chairmanship of Union Minister for Irrigation and Power Gulzari Lal Nanda, out of Ravi-Beas-Satluj waters, Punjab was allocated 5.90 MAF, Kashmir 0.65 MAF, Rajasthan 8 MAF and PEPSU 1.30 MAF. However, as against the past practice, no Royalty was fixed to be paid to Punjab by Rajasthan. 2. While approving the Harike Barrage, the union government had approved a provision for Rajasthan canal with a capacity of 18,500 cusecs. The length of the canal was fixed at 426 miles. 3. on September 19, 1960 Prime Minister of India Jawaharlal Nehru and President of Pakistan Ayub Khan through the mediation of World Bank singed Indus waters treaty whereby right of India over river Ravi waters was recognised thereby having access to extra water for irrigation. 5. In 1976, Indira Gandhi, then Prime Minister of India, further added her own bit to rob Punjab waters. Out of 7.2 MAF water Haryana was allocated 3.5MAF while Delhi was too was earmarked 0.2MAF water. It is worth mentioning here that while calculating the quantum of with pre-reorganistion of Punjab state, before it was distributed among successor states, Jamuna waters were not included as it was flowing through Haryana part of the state. 6. In 1982, Indira Gandhi, ‘pressurised’ Darbara Singh, Chief Minister Punjab to take back petition from the Supreme Court challenging the legality of clauses 78, 79, and 80 of the Punjab Reorganisation Act, 1966. Punjab presently needs 50MAF water for irrigation for its 10.5 million acres of agricultural land. The amount of water flowing out of Punjab is 11.7MAF for which not a penny is paid to Punjab. Out of the total cultivated area 98% is under irrigation. However in Punjab, only 27.4% area is under canal irrigation whereas 72.6% is under tubewell irrigation. Over the years the area under canal irrigation has come down from 1306 thousand hectares in 1969 to 1116 thousand hectares in 2010-11. On the other hand in Rajasthan the area under canal irrigation has more than doubled during the same time. More than 1.4million tubewells of Punjab pumping out water from as deeper layers as more than 350 feet has rung the danger bells. Nearly 80% of Punjab agricultural land is under the immediate threat of becoming desert for want of water, as the underground water is going to become out of reach of the deep tubewells. Even NASA reports has issued such warning. Soon people of Punjab might be forced to leave the state for other parts of the country. The water flowing through the rivers of Punjab, under the Riparian principle, belong to the state of Punjab and cannot be allowed to flow freely. 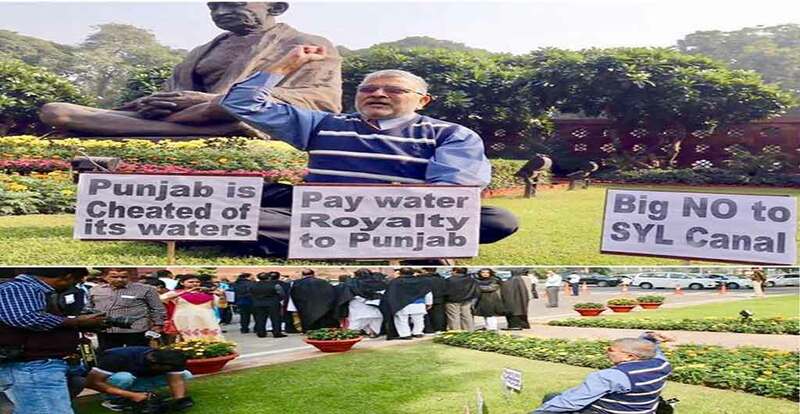 After abrogating all the treaties compromising the interests of Punjab and undoing the injustice, Punjab should be paid royalty ever since the other neighbouring states have started using water which comes out to be in millions of crores of rupees. All the control of water/ dams/ power generation should be transferred to the Punjab government. State shall decide how much water is surplus or not after meeting its own agricultural and drinking water needs. Earlier Dr. Gandhi has written letter to all the Member Parliament LS and RS from Punjab to protest and to raise voice of Punjab infront of National Media and infront of Members of Parliament.